Bruce Clay’s blog and SEO Newsletter wouldn’t be alive without you readers. We read your comments and questions and write step-by-step SEO articles based on your feedback. The article How to Set Up Google Search Console – Free Search Engine Optimization & Webmaster Tools for Your Website, received great comments and questions about how to use this essential SEO software. Whether you’re new to Google Search Console (formerly called Google Webmaster Tools) or have been using it for years, you might have a question or two about its functionality and capabilities. In this article we answer some of the most frequently asked questions about Google Search Console from our readers as well as some additional ones that we hope will make using the tools easier for you. Q. How do I get the most out of Google Search Console? A. Take advantage of new, richer data. This includes average position and referring data for more landing pages. There are two enhanced sets of traffic data in Google Search Console that you should be analyzing and using, according to Robert Ramirez, SEO Manager at Bruce Clay, Inc.
Up until recently, Google Search Console showed limited information about the position of your queries. But with the roll out of the new Search Analytics report, you can now see the daily average position of the highest-ranking result for your queries presented in a new format that makes it easier to read and understand. 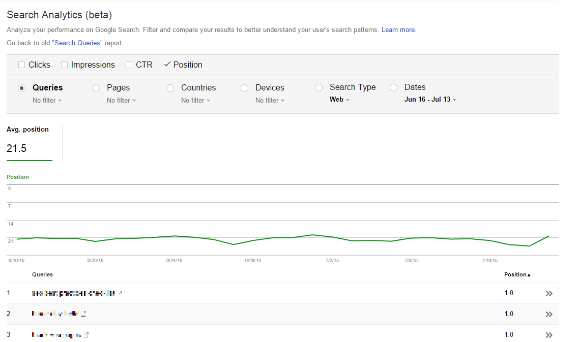 Although average position was featured in the old Search Queries report, the new version adds it as a fourth metric that you can check and view, right next to Clicks, Impressions, and CRT. The new version also changes how the information is displayed. You can now automatically see the average positions of your top 50 queries presented as a trendline in the main Search Analytics report. This information is valuable for when you want to see and analyze ranking fluctuations. It is also an easy way to spot any changes that might have occurred due to algorithm updates. Here are step-by-step SEO instructions to observe average position data in Google Search Console. 1. Sign in to Google Search Console and navigate to Search Traffic > Search Analytics. 2. In Search Analytics, select Position. Here you will see the average position of the top 50 queries used to reach your site. a. Selecting a query. The default time span of the chart is four weeks, and you can increase the time span up to 90 days. b. Hovering over the chart and stopping on the date of your choice to see data for a specific day. c. Using the Dates filter to check-mark the time span you wish you view. 4. Scroll down to the see the average position to see data for each day within that time frame. Along with enhancing data for the average position of queries, Google Search Console now offers referring keyword information on more landing pages. Google’s software used to dish out keyword data for only the top three to five landing pages – a limited look at how people reach your website in Google search. Now, Google Search Console provides a thorough Search Analytics Report for your top 1,000 landing pages – that’s a lot more traffic data you can analyze and use to improve your rankings. 1. Select Search Traffic > Search Analytics. 2. Click on Pages. Scroll down to see all the landing pages. 3. Select the landing page you want. 4. Then select Queries again to see referring data for that landing page. Q. How do I get Google to recrawl my site faster? A. Submit your URL to Google manually. Even without a manual invitation, search engine spiders will ultimately reach and crawl your site’s landing pages if you have linked to them from other pages on your site and your XML sitemap. But there’s a way to send an official invitation that will get them to your site faster than the automatic route: you can submit a URL manually. You can also do this for Bing. Here’s a search engine optimization tutorial on how to manually submit a site to Google and Bing: https://www.bruceclay.com/seo/submit-website.htm. Q. Can I see data for Top Pages and Search Queries for the past year? A. No, Google Search Console provides data for only the last 90 days. While Google Analytics shows a longer history, it doesn’t show search queries. This is why many SEOs and site owners download their data on a monthly basis and create their own reports to monitor the information long-term. One solution is to track your site’s rankings for all your keywords using our SEOToolSet Pro, which runs scheduled ranking monitors. Learn more about how to monitor your search engine rankings using SEOToolSet Pro here: http://www.seotoolset.com/tools/seotoolset-features/. Q. How do I set a date range for the Crawl Error reports? Specifically, how do I get the data for Desktop, Smartphone, and Feature phone together for the last 10 days? Unfortunately, there’s no way to set a data range for the Crawl Error reports in Google. However, you can download the data into a spreadsheet and manipulate it according to the date range you need. To access data for Desktop, Smartphone, and Feature phone, you will need to click on each tab in the report and download the data manually. For more hands-on, step-by-step SEO tips, lead yourself through the 18-step SEO Tutorial. Perform search engine optimization with Bruce Clay, Inc. methodology, from keyword research to competitive analysis to monitoring rankings, with free embedded tools along the way. Extremely useful info specially the last part I care for such information a lot. Thank you and good luck. I always notice to your point for Google searching. I do agree with the point that MANUAL fetching works really well, I have started a new blog last month and had few contents but it was not reaching crawlers even after doing bit of SEO for them but after manual fetching 10 out of 8 pages are crawled. Nice post and very informative about Google search console. Great post Melanie… I was just looking for the post which will give me some guidance on search console. And came across your blog post. Thank you so much for giving complete information about basics of console which are normally unnoticed. Thanks for this great article, it helps a lot.Google search console tool very important. That’s a good question. We tested the graph to determine that it was based on average position for the top 50 terms. Google has not confirmed this, although we hope they expand on how they gather and display their Search Console data soon. Just curious – how do you know that it is showing the average position for the top 50 terms? When I expand to show 500 rows I’m still seeing the same average position data. So just wondering , did Google confirm that those averages are for the top 50 only? thanks! Great post and very informative article. Google search console is an important tool for the webmasters and it has improved lot with the time. The points mentioned above are really very helpful and will surely use it for more data gathering. Nice post. Also we can use to check for duplicate meta title/description under “HTML Improvements” Section, its disavow tool helps to get rid of unwanted links and more.